The Enhanced Battery Assist Lever significantly improves the speed and efficiency of reloads and clearing stoppages without switching hands, allowing you to maintain constant fire control. This device easily installs onto your existing standard mil-spec forged AR bolt release/catch (paddle) with no weapon disassembly or parts replacement, and allows you to lock the bolt back and release the bolt with just a slight movement of your trigger finger. The Battery Assist Lever was recently redesigned from the ground up with considerable improvements giving rise to the Enhanced Battery Assist Lever. Faster reloads The threat is still closing, the pressure increasing. Nothing is more important in the next two seconds than seating a new magazine and chambering another round. That is why we made the bolt release button of the Enhanced Battery Assist Lever 48% larger than the original to enable faster indexing and therefore faster reloads particularly important in the heat of battle. You know you are not out of ammo but your weapon has stopped firing. Diagnostics indicates you have a situation that requires you to lock the bolt back to clear the stoppage. Simply lift up the Battery Assist Lever with your trigger finger while pulling back on the charging handle with your support hand (without the hassle of switching hands) and your bolt is locked open, whether you have thick arctic gloves on or not that is the beauty of the self-centering finger index groove. 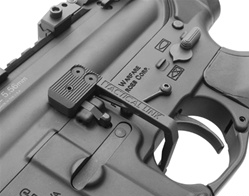 The Enhanced Battery Assist Lever easily installs onto your existing standard AR15/M16 mil-spec bolt release in seconds, with no weapon disassembly or parts replacement, and provides a super-tight rock-solid fit thanks to our exclusive Triple Screw Retention System. Unlike other devices, the Enhanced Battery Assist Lever is designed to avoid making contact with the upper receiver, and does not wobble and will not come loose even under the harshest of use. The Enhanced Battery Assist Lever sports a low-drag receiver-hugging contour and rounded corners everywhere, making it snag-free and comfortable to use. With the original Battery Assist Lever, we learned that not all lower receivers are created equally. Some (i.e. billet receivers) are wider than others. That is why we designed the Enhanced Battery Assist Lever with a Wide Receiver Relief - to provide a better fit on more lower receivers. Compatible with standard / mil-spec dimensioned, right-handed, AR15 / M16 upper and lower receivers, including the HK 416, Sig 516, Sig M400; and also the Cross Machine & Tool billet upper and lower receivers. May not be compatible with the Odin Works XMR Extended Mag Release. Not compatible with the following weapons: FNH SCAR, S&W MP15-22, S&W MP15 Magpul Edition, Ruger SR-762, Sig 716; and may not be compatible with some 7.62 / .308 models. 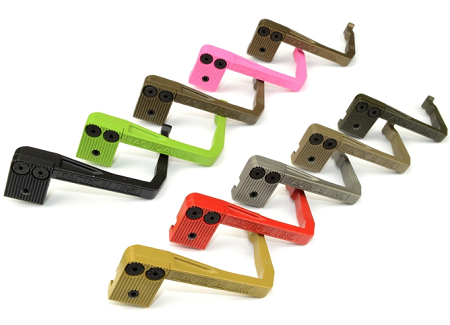 Unlike other devices that sit low and forward in the trigger well (requiring you to break your grip in order to reach it), the Enhanced Battery Assist Lever sits higher in the trigger well and more centered, making it easier to index (even for those with short fingers) allowing you to maintain constant fire control. 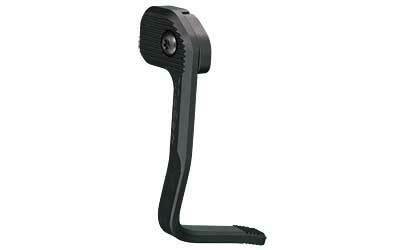 The Enhanced Battery Assist Lever does not interfere with the trigger or the magazine release button. Furthermore, it is ambidextrous and is compatible with the Redi-Mag and the KNS Gen 2 (and Gen 2 Mod 2) Non-Rotating Trigger/Hammer Pins. The Enhanced Battery Assist Lever is precision cast and then coated with an incredibly durable, non-reflective matte Cerakote finish. Available in a variety of colors (depending on inventory levels): Black, Magpul Flat Dark Earth (H-267), Magpul OD Green (H-232Q), Magpul Foliage Green (H-231), Patriort Brown (H-226Q), Burnt Bronze (H-148Q), Titanium (H-170Q), RAL8000 (H-8000Q), Zombie Green (H-168Q), USMC Red (H-167Q), and Pink (H-141Q). We are so confident that you will be 100% satisfied with this product that we’ve backed your purchase with our 30 day money back guarantee.